Zimmerman Cross Drilled Brake Rotors For 2007-2013 R55 MINI Cooper S Clubman, R56 MINI Cooper S, R58 Coupe S, R59 Roadster S, and R57 MINI Cooper S Convertible without JCW brake kit. These are German Manufactured brake rotors. These are extremely high quality OEM replacement rotors. Pretty much the same performance as the stock ones, but a little easier on the pocket book. We pretty much use these on all brake jobs at the shop. 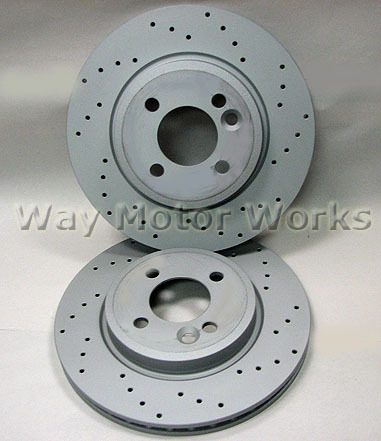 These cross drilled rotors are quiet and super durable. The Cross Drilling allows for extra cooling. Also we don't have problems with them warping like rotors from the local auto parts store. They all come coated to keep them from rusting. Sold in pairs, or complete set of 4. Just changed out the rotors on my 07 Cooper S with the Zimmmerman cross drilled rotors. Had issues with the dull grey color but by the time I drove home they rotor surfaces where nice and shiny and smooth. Will drive a couple hundred miles before final bedding in process is completed but so far I'm loving 'em. Coupled them up with EBC redstuff pad. Again, Way was very beneficial in leading me in the direction I was looking for. Upgrade from stock without going all out with the larger calipers, etc. Didn't break the bank but feels sooooo much more in control on braking. Can't wait till they are totally bedded.